What A Place!! Bay Shore Inn! Something to Do! House & Garden Walk! Summer is in full swing! Escape the heat and head up to Door County! Sail, hanging out at the beach, in a nice B&B - plan a romantic getaway right now! DoorCountyNavigator.com has launched a new Cable TV show in Chicago on Channel 25 (Comcast and RCN) Watch it on Mondays at 3:30PM, Tuesday and Thursday nights at 7:30: "A Peek Inside the Door!" Door County Online Jigsaw Puzzles(tm) now available for your playing pleasure - all on our website! Play now! Wow! We've added some new puzzles! The July Giveaway is already running . . . have you entered yet? A wonderful 2-night stay in at the Parkside in Ellison Bay! And join our Door County fan page on Facebook! We have over 7,000 fans - join us and be part of the excitement! Thanks for your readership, and here we go . . .Summer is rolling - so make your plans now on DoorCountyNavigator.com! Bay Shore Inn is a historic resort that is keeping up with the times. Last year, as part of an extensive renovation project, 33 of the inn's suites were remodeled. Each suite received new kitchen finishes and an updated decorating scheme. New cabinet doors, stunning granite countertops and new sinks and faucets were installed. Oh, and this year, Bay Shore Inn accommodations received new mattresses. "This is a premier property in Door County-one of the nicest ones. We are on the water with a beach and many other fine amenities. We want to keep it that way and continue with upgrades," according to Bay Shore Inn management. Although Bay Shore Inn is keeping up with the times with upgrades, it also has spaces that retain original character. You can see and feel it for yourself when you check in at the historic main lodge. It has a fireplace, sitting room and inviting sun porch in proximity to the water. In addition to the fully equipped and updated kitchens, the suites include a bedroom with a king-size bed, two-person whirlpool Jacuzzis, tastefully furnished living areas (with a sofa sleeper) cable TV and DVD/VCR and wireless Internet. Outdoors at Bay Point Inn don't miss the private sand beach, tennis and basketball courts. Also, bikes, paddle boats, kayaks and row boats can be rented for free. This spacious property also has indoor and outdoor heated pools and whirlpool, a fitness center and group and conference facilities. 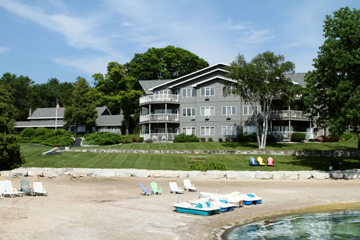 Learn more about Bay Point Inn and other fine places to stay in Door County at www.doorcountynavigator.com. Five homes and gardens will be open to the public during the 52th annual Door County House and Garden Walk on Tuesday, July 31. The event, which runs from 9 a.m. to 5 p.m., is sponsored by the Ministry Door County Medical Center Auxiliary. Included on the tour is the 6,000 square foot colonial style home of Jackie and Tim Danis. After overseeing a major remodel of the Egg Harbor home in 2010, Jackie said she decided to put the property on the house walk this year so people can see what is possible. "Look at a home as a clean slate, and you can start over. Be open to possibilities. Anything can be changed," she said. The couple gutted most areas of the home, opening it up to a view of Green Bay waters. In the great room, they transformed a sterile gray and white interior to a spectacular space with architectural ceiling beams, a tall stone wood-burning fireplace, warm hardwood flooring and more. Other properties on this year's tour include a coastal cottage style condo and the Briggs Orchid Inn in Sturgeon Bay. An open concept home with abundant Door County art is also open in Sturgeon Bay. Rounding out the tour this year is a 1,300 square foot rustic cabin in Fish Creek and gardens on a 1.5 acre wooded property in Egg Harbor. The walk donation is $25 with tickets available at the Door County Visitor Bureau, information centers, area banks and some retailers. Tickets are also sold at the homes on walk day. Call 920/746-1071 or e-mail auxiliaryfunctions@ministryhealth.org. Here's a round-up on some recent Door County happenings! Linger Coffee House is Fish Creek's newest coffee house offering handcrafted coffees, espressos, artisan breads and more. Find it at 9431 Spruce St.
Kim's Boutique has lovely women's clothing as well as lingerie. It's located in the Main Street Shops, Egg Harbor. The Harmann Building, 211 and 215 N. Third Ave., Sturgeon Bay has new owners. Jeff and Sarah Bradley, have relocated their two businesses-Artists Guild and Small World Market--into the building. The Sturgeon Bay Family Restaurant re-opened at 239 Green Bay Rd., adding Italian dishes to its offerings.